The term "caftan" (from Ottoman Turkish qaftan) is used to refer to a full-length, loosely-fitted garment with long or short sleeves worn by both men and women, primarily in the Levant and North Africa. The garment may be worn with a sash or belt. Some caftans open to the front or side and are tied or fastened with looped buttons running from neck to waist. Depending on use, caftans vary from hip to floor length. The caftan is similar to the more voluminous djellaba gown of the Middle East. Contemporary use of the label "caftan" broadens the term to encompass a number of similarly styled ancient and modern garment types. The origin of the caftan is usually tied to Asia Minor and Mesopotamia. Caftan-like robes are depicted in the palace reliefs of ancient Persia dating to 600 B.C.E. By the thirteenth century C.E., the style had spread into Eastern Europe and Russia, where caftan styles provided the model for a number of different basic garments well into the nineteenth century (Yarwood 1986, p. 321, 62). The caftan tradition was particularly elaborate in the imperial wardrobes of the sixteenth-century Ottoman Empire in Anatolian Turkey. Caftans of varying lengths constructed from rich Ottoman satins and velvets of silk and metallic threads were worn by courtiers to indicate status, preserved in court treasuries, used as tribute, and given as "robes of honor" to visiting ambassadors, heads of state, important government officials, and master artisans working for the court (Atil 1987, p. 177, pp. 179-180.) Men's caftans often had gores added, causing the caftan to flare at the bottom, while women's garments were more closely fitted. Women were more likely to add sashes or belts. A sultan and his courtiers might layer two or three caftans with varying length sleeves for ceremonial functions. An inner short-sleeved caftan (entari), was usually secured with an embroidered sash or jeweled belt, while the outer caftan could have slits at the shoulder through which the wearer's arms were thrust to display the sleeves (sometimes with detachable expansions) of the inner caftan to show off the contrasting fabrics of the garments (1987, pp. 182-198; p. 348). Loose pants gathered at the ankle or skirts were worn under the entari. What Is the Best Dress for My Body Shape? Caftan-style robes are worn in many parts of the world where Islam has spread, particularly in North and West Africa. In parts of West Africa, the practice of layering robes to express the aesthetic principle of "bigness" in leadership dress (Perani and Wolff 1999, pp. 90-95) and the giving of "robes of honor" is shared with the Ottoman tradition (Kriger 1988). In Western culture, caftans became part of the international fashion scene in the mid-twentieth century. In the 1950s, French designer Christian Dior adapted the caftan style to design women's floor-length evening coats (O'Hara 1986, p. 60). In the 1960s, the caftan as a unisex garment gained visibility as hippie trendsetters adopted ethnic dress. Largely through the influence of fashion maven Diana Vreeland, the editor of Vogue magazine, the caftan entered into the haute couture fashion scene. After a visit to Morocco in the early 1960s, Vreeland published a series of articles in Vogue championing the caftan as fashionable for "The Beautiful People" (Harrity 2003). Yves Saint Laurent and Halston were designers who included caftan-styled clothing in their lines (O'Hara 1986, p. 60). Since that time, caftans continue to have a market for evening and at-home wear for women and a more limited market with homosexual males (Harrity 2003). The caftan is now marketed globally as "fashion." Contemporary designers draw their inspiration from a number of different historic traditions. For example, Hubert Givenchy draws upon the Middle Eastern tradition. 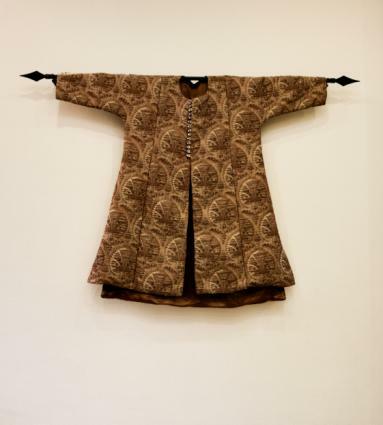 African designers present the "dashiki caftan" based on West African prototypes. The J. Peterman Company markets a "Shang Dynasty Caftan" for women, copied from a Chinese silk ceremonial robe dated to 2640 B.C.E. In this globalization of the caftan, top Italian designers began marketing costly "designer caftans" in materials as diverse as silk and sheared mink to elite women of the Arab Middle East nations (Time International, Dec. 9, 2002). See also Djellaba; History of Pre-Islamic Dress Iran; Middle East: History of Islamic Dress. Atil, Esin. The Age of Sultan Suleyman the Magnificent. Washington, D.C.: National Gallery of Art; New York: Harry N. Abrams, Inc., 1987. Includes an excellent discussion of sixteenth-century imperial Ottoman caftans in the collection of the Topkapi Palace in Turkey. Kriger, Coleen. "Robes of the Sokoto Caliphate." African Arts 21, no. 3 (1988): 52-57, 78-79. O'Hara, Georgina. The Encyclopaedia of Fashion. New York: Harry N. Abrams, 1986. Perani, Judith, and Norma H. Wolff. Cloth, Dress, and Art Patronage in Africa. Oxford and New York: Berg Press, 1999. Stillman, Yedida Kalfon. Arab Dress: A Short History from the Dawn of Islam to Modern Times. Boston: Brill, 2000. Yarwood, Doreen. The Encyclopedia of World Costume. New York: Bonanza Books, 1986. Calderwood, Mark. "Ottoman Costume: An Overview of Sixteenth Century Turkish Dress." 2000. Previously available from http://www.geocities.com/kaganate.